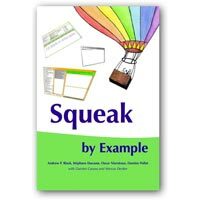 The Squeak Wiki collects useful information about the language, its tools, and several projects. Itâ€™s a wiki, so you can participate! 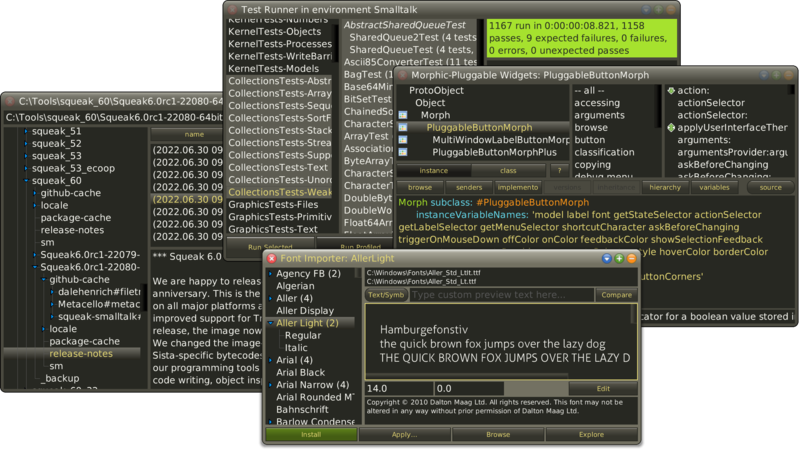 The Squeak Oversight Board coordinates the communityâ€™s open-source development of its versatile Smalltalk environment. The Squeak community maintains several mailing lists such as for beginners, general development, and virtual machines. You can explore them all to get started and contribute. The Weekly Squeak is a blog that reports on news and other events in the Squeak and Smalltalk universe. If you identify an issue in Squeak, please file a bug report here. 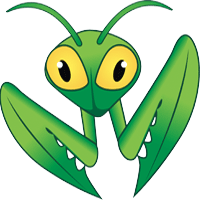 Squeak core developers regularly check the bug repository and will try to address all problem as quickly as possible. 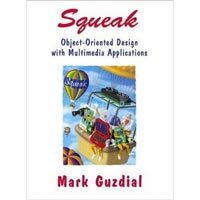 A Monticello code repository for Squeak. Many of our communityâ€™s projects are hosted here. Others you may find at SqueakMap or the now retired SqueakSource1. 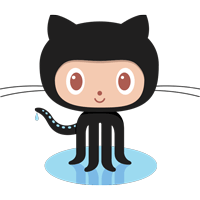 With FileTree, you can manage your code and changes with a version control systems like Git on GitHub. Andrew Black, StÃ©phane Ducasse, Oscar Nierstrasz, Damien Pollet, Damien Cassou, and Marcus Denker. Square Bracket Associates, 2007. Mark Guzdial and Kim Rose. Prentice Hall, 2002. Mark Guzdial. Prentice Hall, 2001. 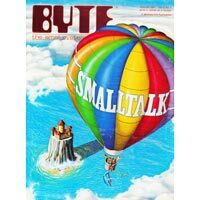 Smalltalk special issue, August 1981. The current Squeak release comes in various bundles including the â€œall-in-oneâ€� package, which works on Windows, macOS, and Linux (x86/ARM). Download, unzip, and double-click the appropriate file: *.bat for Windows, *.app for macOS, and *.sh for Linux. You can always take a look at the progress in the latest alpha version. Feel free to participate with commits to the inbox. Alpha versions are not expected to be stable. Make sure to also get the latest VM. Everything is an object. 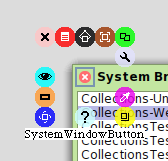 Objects collaborate by exchanging messages to achieve the desired application behavior. 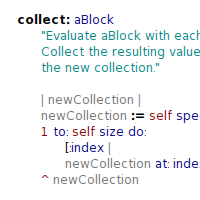 The Smalltalk programming language has a concise syntax and simple execution semantics. 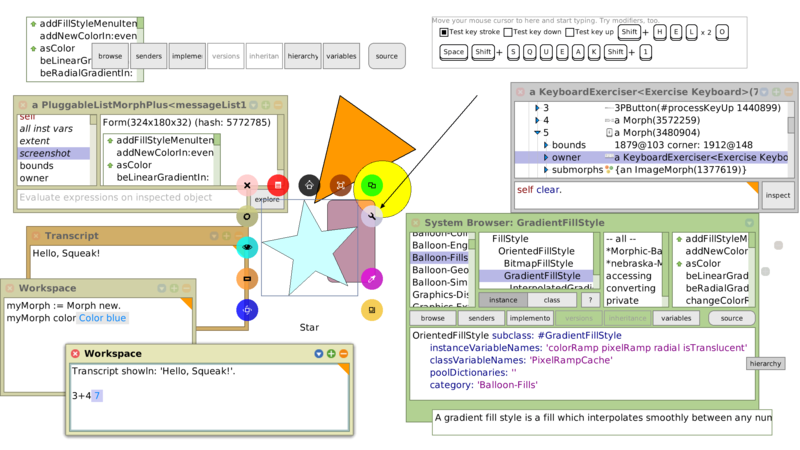 The Smalltalk system is implemented in itself: Compiler, debugger, programming tools, and so on are all Smalltalk code the user can read and modify. Novice programmers can get started easily and experts can engineer elegant solutions at large. All graphical objects are tangible and interactively changeable. This promotes short feedback loops and low-effort application development. 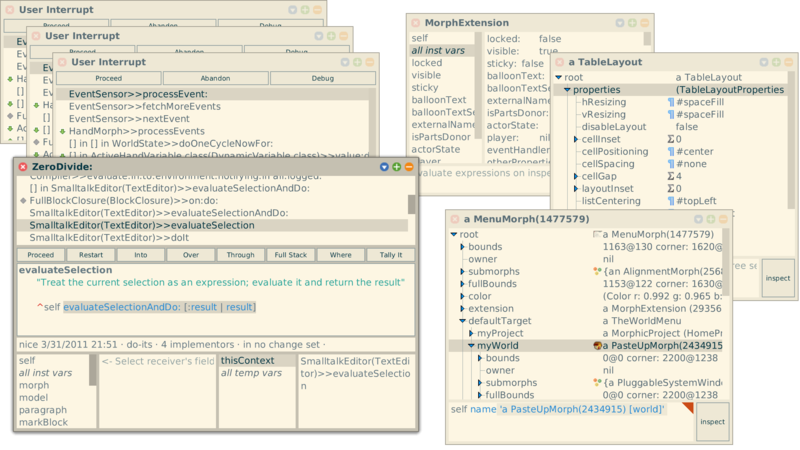 Morphic thus leverages the live programming experience of traditional Smalltalk environments from a mainly text-focused domain to a graphical one. 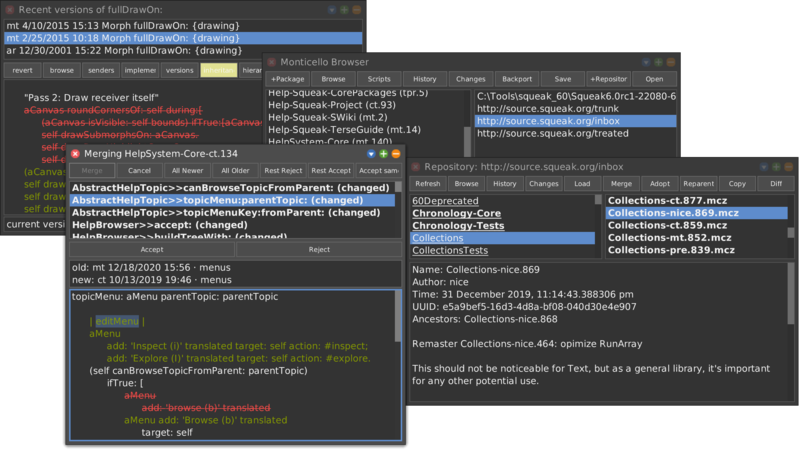 The dynamic Squeak environment provides a variety of tools for browsing, writing, executing, and versioning Smalltalk code. 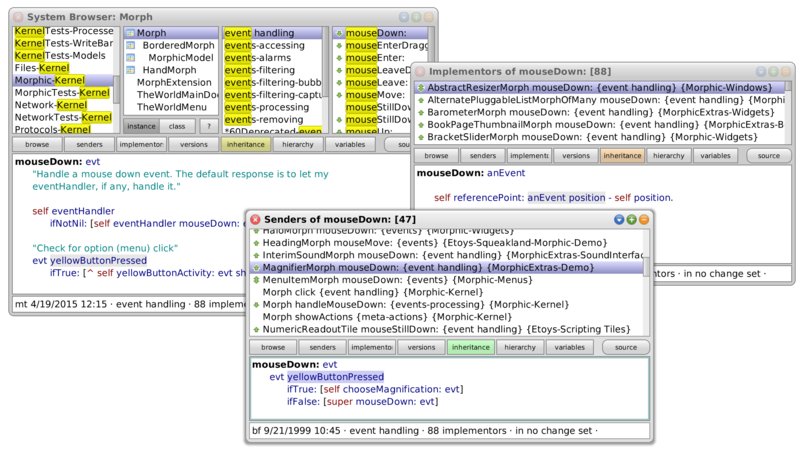 Multiple debugging sessions can be served concurrently. 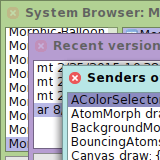 Thanks to Morphic, tool customization can be achieved with reasonable effort. There are several fast Squeak VMs that also support other languages of the Smalltalk family. Meta-tracing, just-in-time compilation, stack-to-register mapping, and aggressive in-line message caching yield efficiency in executing Smalltalk byte code. 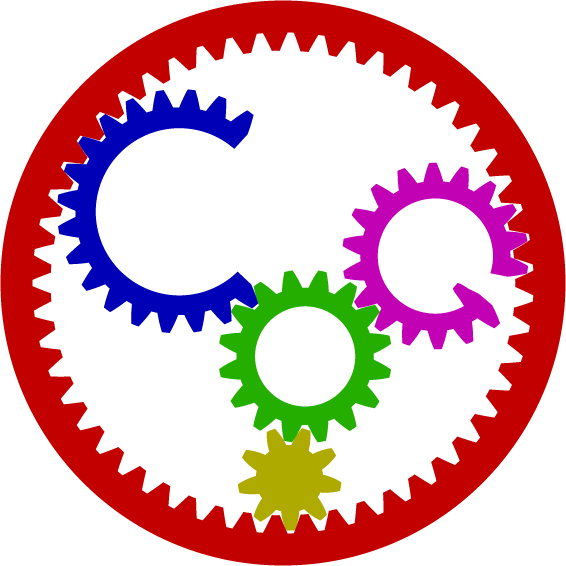 An implementation of Babelsberg allowing constraint-based programming in Smalltalk. Make sure you have Metacello installed. A collaborative, live-programming, audio-visual, 3D environment that allows for the development of interactive worlds. 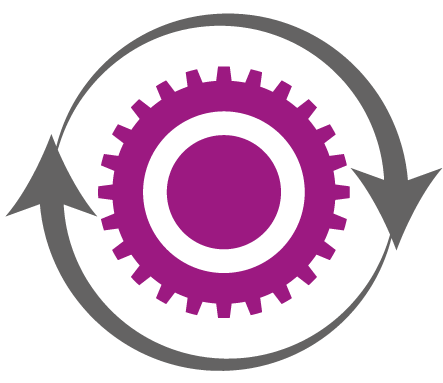 A media-rich authoring environment with a simple, powerful scripted object model for many kinds of objects created by end-users that runs on many platforms. 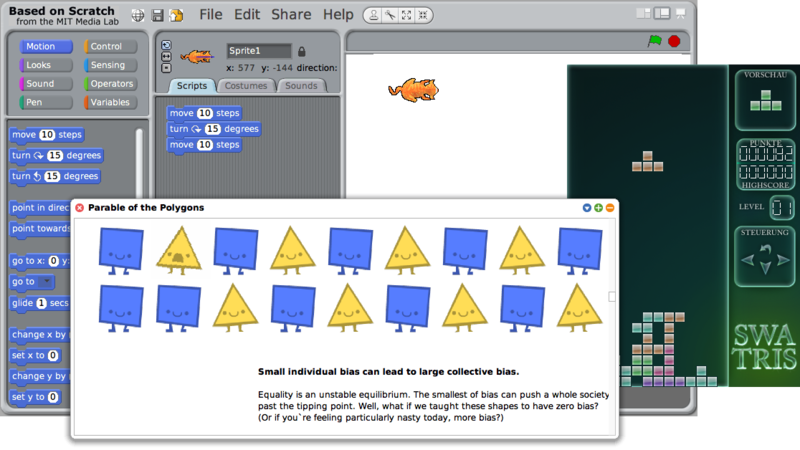 Scratch lets you build programs like you build Lego(tm) - stacking blocks together. It helps you learn to think in a creative fashion, understand logic, and build fun projects. 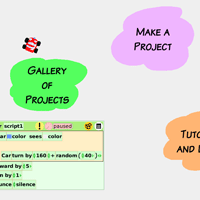 Scratch is pre-installed in the current Raspbian image for the Raspberry Pi.